Vineyard Cuisine is the art of food preparation incorporating wine and fresh garden ingredients. It is about creating a dish that makes the wine “sing”. It is really the herbs, spices, and sauces that create that bridge of flavors that can make wine “Sing”. 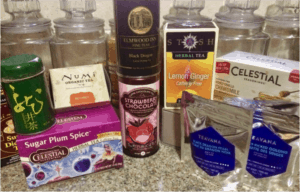 Teas not only create healthful beverages but act as quick flavoring bags for recipes. Add unique flavors, texture and tannins to stocks, sauces and broths with tea bags. I keep a “tea pantry” in my kitchen. For instance, Numi Rooibos is a red tea chock full of medicinal value plus it adds a woodsy vanilla flavor to stews, demi-glace, and roasted meats and veggies. Just add a tea bag to the liquid and allow it to steep as you cook. It makes a rich pairing with big reds like Messina Hof Cabernet Sauvignon, Reserva Sagrantino, and Cabernet Franc. Elmwood and Teavana Black Dragon teas add a nice depth that pairs nicely with Messina Hof Tempranillo, Sangiovese, and Primitivo. Two of my favorites are Stash Lemon Ginger tea and Celestial Honey Vanilla Chamomile. I add it to my white stocks, beurre blanc, and baked chicken. The Stash adds a zesty fresh flavor that marries well with crisp white wines like Messina Hof Pinot Grigio, Gewurztraminer, Chenin Blanc. The Chamomile yields a creamy honeyed character that is lovely with our Riesling. Celestial Sugar Plum Spice adds a delicate holiday flavor that marries nicely with Messina Hof Pinot Noir. The Republic of Tea Strawberry Chocolate tea is a dessert by itself. Steep this bag in scalded mild before adding it to recipes or latte’. It complements nicely Papa Paulo Ports and Solera Sherries. As you experiment with the teas, enjoy a cup so that you can appreciate the available flavors. Then save that tea bag and include it in a dish. As you try this, what are your favorites?